It should come as no surprise that the WOAA Sr. Hockey League’s regular season is coming down to the final games to determine the playoff picture. The standings have been jammed from 3rd place to 11th place all season, and with two weekends left, the situation remains largely the same. 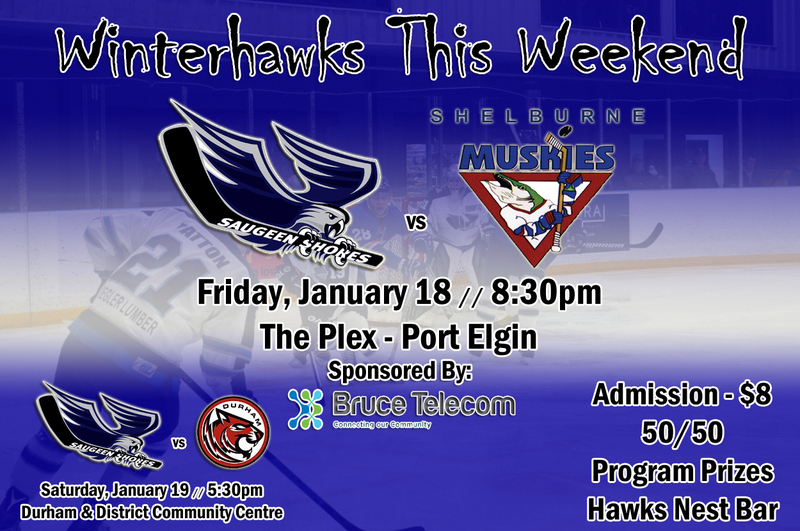 The Saugeen Shores Winterhawks enter their final two games in 4th place, with an opportunity to control their own destiny and grab 3rd place from the Durham Thundercats. The Winterhawks can clinch their Sr. “AA” playoff spot with a win over the Shelburne Muskies at home on Friday night, and could also clinch home ice advantage in the opening round if a win is coupled with a Tavistock loss at Clinton. Win four tickets to Friday night’s game, head to game sponsor Bruce Telecom’s Facebook page for details! Enter by Wednesday at noon! Regardless of the outcome on Friday night, a showdown in Durham on Saturday evening will have significant meaning. The Winterhawks enter the weekend two points behind Durham, each with two games left, both teams have 13 wins, the difference is Durham has three overtime losses to the Winterhawks one. The Winterhawks can clinch 3rd place with wins over both Shelburne and Durham, as long as the latter comes in regulation. If the Winterhawks lose to Shelburne in regulation, they can still take 3rd place, but would have to defeat Durham in regulation on Saturday, and then would need Ripley to beat Durham in regulation the following Friday night (Jan. 25th). 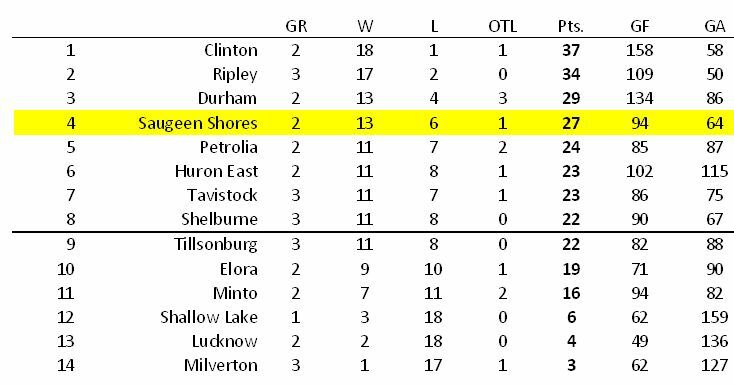 In that scenario, Saugeen Shores and Durham would finish in a tie at 29 points, but the Winterhawks would hold the tiebreaker by virtue of having 14 wins to Durham’s 13. Losing either game, or both, brings the teams behind the Winterhawks into the equation. Entering the weekend, the Petrolia Squires hold down 5th place with 24 points with two games left to play, in Tillsonburg on Friday night, followed by in Seaforth on Saturday against Huron East. The Centenaires are currently tied for 6th place with Tavistock at 23 points, though Tavistock has a game in hand, with three left to play. Tavistock is at Clinton on Friday night, followed by hosting Milverton on Saturday, wrapping up on the road at Elora on Jan. 25th. Huron East plays host to Petrolia on Saturday night, finishing up on the road at Milverton on Jan. 26th. The game at The Plex on Friday night will also be a pivotal one for Shelburne, as they are tied for the 8th-and-final playoff spot with the Tillsonburg Thunder at 22 points. Tillsonburg hosts Petrolia on Friday night, followed by a Saturday afternoon meeting with Minto. Shelburne hosts Clinton on Saturday. A huge showdown awaits with the Muskies in Tillsonburg on Jan. 26th in a game that could determine the final playoff spot. The Elora Rocks remain mathematically alive in the race at 19 points, though they have to win both remaining games and receive some help along the way to jump into the Sr. “AA” playoffs. Missing on the list are the Minto 81’s, who were forced to forfeit seven points last week as a result of the WOAA board of directors ruling they used an ineligible player earlier in the season, dropping them to 11th place. In any event, the league’s tie-breaking procedures will likely be required when the dust settles. The Clinton Radars and Ripley Wolves will finish 1st and 2nd in the standings, with Clinton currently holding a three-point edge. Minto, Shallow Lake, Lucknow and Milverton will be participating in the Sr. A playoffs, along with the two remaining teams that drop out of the top-8.